We’re all guilty of it. Whether it’s being bent over a computer, steering wheel or cell phone, bad posture is a part of our daily life. Unfortunately, a sore back or stiff neck may be just the tip of the iceberg when it comes to health problems that are associated with Forward Head Posture. Forward Head Posture (FHP) is a forward displacement of our head over our chest. This causes the shoulders to round forward and your ears will sit forward of the shoulder instead of sitting directly over the shoulder. Several studies have recently been done showing that this slouching causes an increase in stress and tension on the spine. Hours of sitting in front of a computer or texting and scrolling on your cell phone can put your body in a state of high stress. It may not be possible to completely eliminate FHP, but there are several things that can be done to minimize its effects. Be aware. Sometimes all it takes is being aware of a problem so that you can consciously work on correcting it. Notice when your head is moving forward and your shoulders are rounding and readjust your posture. Use hands-free functions whenever possible on cell phones. Never use a laptop on a surface that isn’t ergonomic. No, your laptop shouldn’t sit on your lap. Stretch. It’s been said time and again but stretching really will make a difference. If you’re getting ready to sit down in front of your computer, take a few minutes to stretch first. Exercise. Use exercises like strength training and yoga or pilates to build up your core muscles (back, glutes, and stomach). 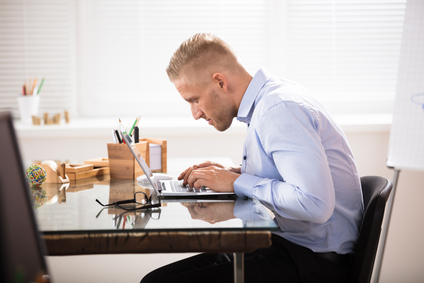 Even for people with great posture, the constant use of computers and cell phones, make it an almost certainty that nearly everyone will be affected by FHP. If you’re identifying posture as a problem or are unsure if your symptoms may be a result of FHP, getting checked by a health professional like a chiropractor can help detect the extent of damage that may be occurring. Making small changes can create a big impact on your day to day activities and health.